Gold tone marching cymbals with wooden handles. 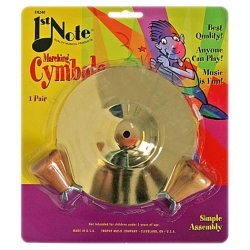 These cymbals are perfect for schools and theatrical use, as part of a cymbal monkey costume, or for musical play time. The set includes two cymbals, measure 5” in diameter, and require easy tool less assembly.